Rich Hill couldn’t command either his fastball or curve, which was a problem since he only has a fastball and curve. Hill surely wasn’t helped by a bizarre strike zone where the umpire seemingly couldn’t get a handle on how to deal with his curve, but for the most part it was Hill who didn’t help himself. Hill walked a whopping 7 batters on the night in 4 innings, which is primarily what drove him to surrender 5 runs, as he gave up only 4 hits and struck out 4 batters. However, only 40 of your 82 pitches going for strikes is generally going to end badly, and this certainly did. Was that kind of day. 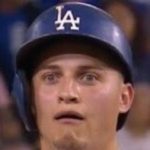 Ross Stripling relieved Hill and got 2 scoreless frames in relief, giving up just 1 hit and 1 walk while striking out 3. Sergio Romo got a frame of his own … and gave up a homer to a righty. It’s just hard to see his utility on the roster at this point, because there are better options waiting for a chance. Chris Hatcher finished the game off for the Dodgers with 2 scoreless innings of his own, and I guess if you squint he could be the last man out of the pen or something. It wouldn’t have mattered much, however, as the offense stalled for the second game in a row. They amassed just 4 hits on the night, scoring just a single run in the 7th on a Cody Bellinger sacrifice fly. That … seems like an issue. The loss drops the Dodgers to 27-20 overall and 17-8 at Dodger Stadium. That would actually be totally fine if it wasn’t for the fact that the Rockies and Diamondbacks refuse to ever lose a game. Tomorrow is the rubber match with the Cardinals, and it starts at 4:10 PM HST/7:10 PM PST/10:10 PM EST. Kenta Maeda (5.03 ERA/4.40 FIP/4.37 DRA) will come off the disabled list to make the start after seemingly turning his season around of late, and he’ll square off against Michael Wacha (2.74 ERA/3.41 FIP/3.21 DRA), who might be good again.